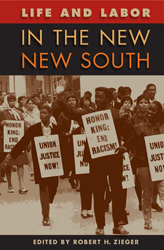 Announcing the publication of Dr. Robert Chase’s article “Slaves of the State’ Revolt: Southern Prison Labor and a Prison-Made Civil Rights Movement” in Robert Zieger’s collected anthology, Life and Labor in the New, New South (University Press of Florida 2012). Congratulations Robert! I look forward to reading your article as well as those of your colleagues. Archivist and librarian Aaisha Haykal graduated from Syracuse University in Syracuse, New York with B.A. degrees in English and Textual Studies and African-American Studies in 2009. In 2011, Haykal received her Masters of Science in Library and Information Science at the University of Illinois at Urbana-Champaign. Haykal is a member of several professional associations including the Society of American Archivists and the American Library Association. She can be reached at haykalan at cofc dot com or at anhaykal at gmail dot com. The opinions expressed in this blog are personally held by the individual authors and do not reflect any position of the Avery Research Center or the College of Charleston. © 2019 Not Just in February. All Rights Reserved.